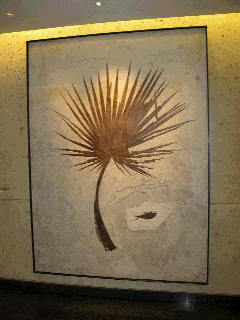 The late philanthropist and oil executive Loyce L. Youngblood has collected and donated amazing fossils to the Laurence S. Youngblood Energy Library at the University of Oklahoma, named in honor of her late husband, Laurence, pioneer oilman and founder of the nation's one-time largest oil and gas leasing firm. Spectacular fossils also graced the 8,000' Nichols Hills, OK residence of the late Loyce Youngblood, including this 6' Large Sabal Palm Frond draped over an apparent fish fossil, believed underlying a left portion of the unusually large fan body. (See close-up exandable views at left). 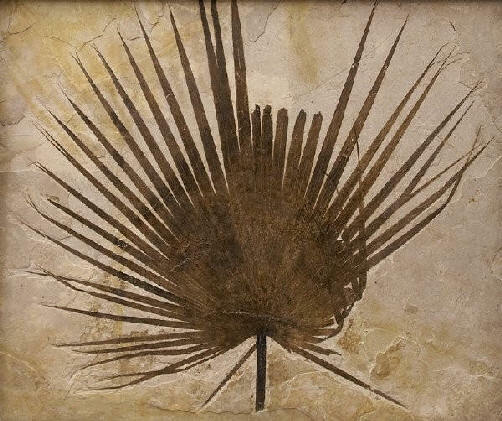 This Large Sabal Palm, in its 81'"x 68" contrasting limestone slab with a museum-quality patinated bronze frame, originally cost $99,733, and was estate tax-appraised for $65,000 in 2007. (This sole remaining unsold private fossil from the former Estate of Loyce L. Youngblood is currently offered for sale at $77,800 by the Youngblood Estate heirs).